Lord and Lady Sinderby hosted a shooting party at their estate. I am not a great fan of hunting or guns, but I found much to focus on with the family drama, including Sinderby's mistress and small child showing up at a big gathering. Rose saved the day by pretending to be friends with the mistress and then seeing her off. Mary met a handsome new man, Henry Talbot, at the gathering and flirted with him. Edith also met a man at the gathering, Mr. Pelham; he seems like a nice chap. After a health scare, Lord Grantham made peace with Edith and welcomed Marigold into the family. Lord Kuragin reunited with his princess, a gloomy and unpleasant woman, and went off to Paris with her. Isobel received a nastygram from Lord Merton's son, Larry, and broke things off with Merton. Carson proposed to Mrs. Hughes and she accepted. I am restraining myself from typing this in all caps, but it is very big news! Bates "confessed" to Green's murder to get Anna out of jail. Molesley and Baxter played detective to get him off the hook ... and reunited with Anna. Tom had a lovely farewell to Downton Abbey, both in the children's nursery, remembering Sybil with Mary and Edith, and at the Christmas gathering downstairs. He is by far my favorite DA character, and as Mrs. Hughes said, a bridge between upstairs and downstairs. I think he also has served as a bridge between viewers and the the very privileged Crawley family. 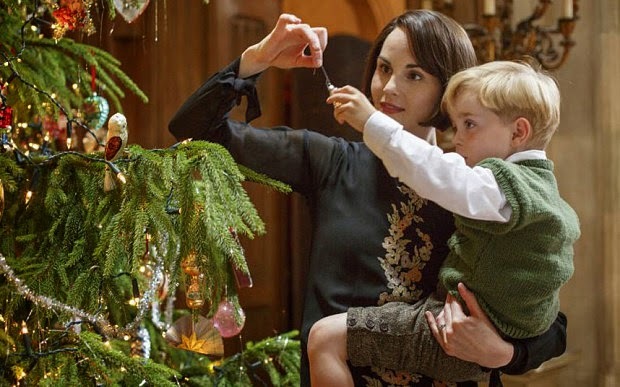 Christmas at Downton Abbey was so beautiful! I especially loved seeing the tree, and the children's wonder looking at it. Carson's proposal to Mrs. Hughes and her acceptance was sheer perfection. Finally! I think this was my favorite scene of the entire 5th season. Romance for Mary, perhaps with the new suitor introduced in this episode? A new puppy at the Abbey (although Isis will still be fondly remembered). More great Dowager Countess quotes! How about you? What did you think of this episode? What would you like to see happen next season? Hi Kristi, thanks for your comment. I agree with you about Mary ... it would be nice if she had a more agreeable attitude.